Home / Media Centre / FAQ / How do I search the Proceedings Library? The IPPS website is run by a general search field that searches all keyword related content throughout the website. If you search for "Roses" for instance, Proceedings with the term "Roses" will be displayed in the search results. Below are the instructions and an example on how to search the proceedings library. 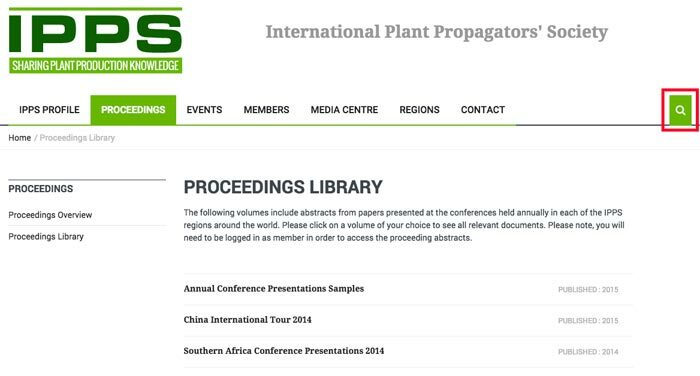 On the screenshot below, you will see a typical page on the IPPS website. In this case, the user is already logged in and on the Proceedings Library page. Click on the little green search icon at the top right hand side of the page (seen in the red below below). A light grey bar will appear and ask you to include your search keywords. Place your mouse in the grey area and type in your search keywords. 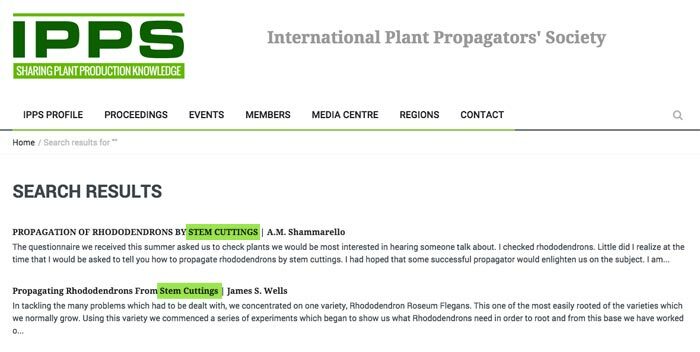 In the example below, the user is searching for "Stem Cutting". To initiate the search function, press ENTER on your keyboard. The website will now display a page with all items matching your search results. See the example screenshot below. From here you can click of any of the links provided to read more. Remember, in order to view "Member's Only" items such as the Proceedings Library, you must be logged in and your membership status must be paid up / active.